We here at Boardwalk Floors specialize in hardwood floor re-finishing. We have over 24 years of experience in the wood flooring business! You deserve an experienced crew to bring your old, worn out looking wood floors to new life. We can make your wood flooring look like new again! See our wood flooring gallery! Boardwalk Floors provides sand, stain and finish services of all types of hardwood floors. 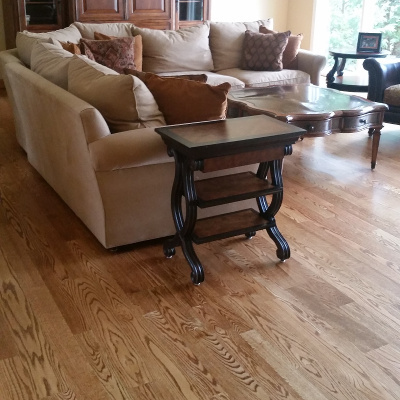 We will make your old, worn out and scratched hardwood flooring look like new! Boardwalk Floors can stain your wood flooring with numerous different stain colors. Whether dark colors, light colors or natural, Boardwalk Floors can provide you with the exact color that your wood flooring job requires. Boardwalk Floors is a family owned and operated wood flooring company. We specialize in hardwood floor installation and sanding down and re-finishing of hardwood flooring. If your hardwood flooring is looking old, worn out or worn through then you need our services. We can sand down your old hardwood flooring, apply a coat of sealer or stain of your choice then then apply at least 2 coats of finish. We can use any of the top brands of finishes available such as: Bona Traffic, Dura Seal, Glitza, Mega and more! Some finishes are harder than others and some finishes are more cost effective. We will work with you, our customer, to decide which finish is best for you and your specific circumstances. Whether it's oil based or acrylic based, we will provide the best possible finish for your particular job. Boardwalk Floors has been refinishing hardwood floors for over 24 years. We have a long list of satisfied customers. Your satisfaction is our number one priority. Our experience and dedication to perfection will provide the best possible outcome for your hardwood floors. Whether you have an exotic hardwood floor or a domestic hardwood floor, we can make them look like new! We can install oak wood flooring, maple wood flooring, hickory, ash, birch, walnut and many other domestic hardwood flooring species. Some exotic species include: Brazilian cherry, cumarou and many more. Hardwood floor refinishing can make your home look new again! Not only do we refinish old worn out wood flooring but we also install brand new wood flooring. We can install factory prefinished wood flooring or install unfinished wood flooring. If you choose prefinished wood flooring, once it's installed, you can walk on it. Once a prefinished hardwood floor is installed, it's done. Nothing else needs to be done. If we install an unfinished hardwood floor, then we must sand it down, seal or stain the hardwood, then apply at least 2 coats of high quality floor finish. This process can take a few days and sometimes it's best if the homeowner is absent from the home. Even though we use a low dust system, there will still be some dust present in the air. Plus the smell from the wood finishes can be hard to live with during the finishing process. Boardwalk Floors has the expertise to install either type of hardwood flooring. Our promise to our potential clients is that we will provide the best possible service, the best possible job and the best possible advice so that our customers can make the best possible choice for themselves. We are here to service our customers to the best of our ability. Repairing of hardwood floors is also one of our specialties. Whether you have damage from water, scrapes or gouges, chips, cracks or anything else, Boardwalk Floors can repair your hardwood flooring. Hardwood flooring can be repaired or replaced depending upon the actual damage done to the hardwood floor. Water damage hardwood floor repair involves getting the floor dried out first before we can repair or replace the damaged floor boards. Boardwalk Floors has extensive experience in the hardwood flooring repair service! Decorative Concrete and Concrete Resurfacing! Boardwalk Floors in it's ongoing effort to add value added services for our customers is now providing concrete resurfacing and decorative concrete services! Stunning visuals can be achieved with our decorative concrete products. Wood looks, stone looks, granite, tile and flecks are just some of the styles and patterns we can apply. Make your boring driveway into a beautiful stone looking driveway. Turn your patio or pool deck into a stunning flagstone oasis. Garage floors can be sealed against salt, oil and other contaminants. Basement floors can be beautified and sealed with ultra durable epoxy coatings. We can apply a driveway sealer, garage floor coating or stain a patio! These are high quality concrete resurfacing products that beautify and protect your concrete floors and surfaces. We are proud to introduce a new product and service. Decorative Concrete!. It can go by many names: concrete stamping, stained concrete, concrete protector, epoxy garage flooring and others. It is a system of protecting and beautifying your concrete floors. Click here to learn more! Christine and her staff is AWESOME!! Beautiful work, professional service and the prices are great to! I would definitely recommend them for all your flooring needs!!! Boardwalk Floors did a great job. Communication was excellent and the quality could not be better. You cannot tell the difference between the new hardwood and the existing hardwood - no small feat considering multiple walls were removed to create one large room. The finished product looks amazing and was well worth the cost. Christine (owner) and her hard working crew (Jake and Jason) recently completed a floor project at our home we purchased last year on Green Lake in West Bloomfield.